Beyond The Frontier: Dreadnaught is set shortly after Admiral â€˜Black Jackâ€™ Geary proved his place in history by defeating the Syndicate Worlds. 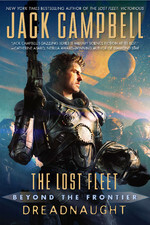 Geary is given command of the First Fleet and ordered to investigate the enigmatic aliens that have been discovered on the edge of human space. Geary begins to wonder if someone in the Government wants him dead and whether he and the entire fleet have been sent on a suicide mission. There is a lot of talking in Dreadnaught. In fact, the first half of the story is almost entirely dialogue. However, it is well-written dialogue and is used to subtly advance the plot and set-up the characters. The political machinations of the Alliance Government are not shown directly but rather alluded to by discussions between the main characters. It might have been interesting to have seen more of this first-hand rather than through dialogue but Campbellâ€™s method is effective in creating a possible and as yet unseen foe at home. The second half of the story really ramps up the action as Geary and the fleet enter the territory of the aliens. Campbellâ€™s military background shines through in the narrative and his portrayal of battles and military life are amazingly rich and fascinating. Campbellâ€™s narrative is easy-flowing and absorbing from the outset. He manages to create a believable setting with ease and the story draws you in immediately. Dreadnaught comes across as building up the plot for subsequent novels but it is thoroughly enjoyable in its own right. This was the first book Iâ€™ve read by Jack Campbell but it wonâ€™t be the last.